Could you resist this face? - We couldn't! The day we met "Jack" Jack's days as "Jacqueline" Jacqueline becomes "Mac"
The day we met "Jack"
John and I live at Ocean Grove, a seaside resort about 100 kilometres south of Melbourne in Victoria, Australia. Ocean Grove overlooks Bass Strait, with the island state of Tasmania to the south east, and if you keep heading directly south, you eventually reach Antarctica. Our home is about 2 minutes stroll from the beach, and every morning my day starts with a walk along the beach. On Sunday 11th August, 1996, John and I went for our walk before 7.30 in the morning. Although it was winter, the sun was shining, the sky was cloudless and it was just a magnificent day. About 10 minutes into our walk there was a ruckus ahead with a dog and three people. The dog had found a seal on the beach at the bottom of the sandhills - it seemed to be a very young seal. The men picked it up, carried it down to the water and sent it on its way. We couldn't believe that the seal didn't try to bite them, but it soon became obvious why. It could barely swim - in fact it spent most of the time lying on its back resting in between contending with the surf which was pretty heavy. It was swept along a bit to the west but eventually the surf forced it back onto the beach behind us. By then a few more people appeared and one couple volunteered to go and ring Jirrahlinga Wildlife Sanctuary at Barwon Heads. In the meantime we started babysitting and keeping the dogs and kids at a distance. Jack was pretty distressed (it didn't take long to give him a name!) and when he tried to sit up we noticed he was quite thin - all his ribs were showing and his right eye didn't open properly. Whenever a dog barked or a kid yelled, he fretted and tossed around, quite upset. Although it was a beautiful day, there was a bit of a breeze from the south west, so John built him a sand wall to protect him from the wind and eventually he settled down to sleep. Whenever anyone approached, he'd open his good eye really wide, look at us to see if there was a problem, and as long as we sat still and calm, he decided everything was OK and went back to sleep. For the first hour or so, (we were still waiting for the rescue crew) he was huddled up and quite tense, but with the warm sun and a bit of peace, he relaxed and stretched a few times (just like a pussycat) and seemed to relax. By the time the sun dried him out, we realised just how young he was. His coat was very silver and soft and fluffy. His face and belly were very white and when he opened his good eye he looked just beautiful - his eye was almost half the size of his head! Needless to say, Jack gathered a large audience, especially kids who were rather noisy. We managed to keep them occupied by putting them on dog patrol - whenever a dog came from either direction, it was their job to get the owners to put them on a lead and keep them away from Jack. There were so many couples with dogs - one would keep the dog well back while the other crept up to look at Jack, then they'd hold the dog while the other came for a look, then they'd take their dog back the other way so as not to disturb Jack. The local milk bar kept us supplied with milkshakes while we babysat, and they put more calls through to the rescue group who were taking their time getting there! One group of excited kids only got dragged off with the promise that they could make some tuna sandwiches for Jack if they went home!! The bush telegraph was working well as people seemed to arrive from everywhere asking "Where's the baby seal? ", barely noticing Jack hiding behind his own private sand castle! People would stay for about ten or fifteen minutes, then wander off, but the dogs kept coming and we just couldn't leave Jack until some real help arrived. It was after midday before the Fisheries department finally arrived. By then Jack was pretty relaxed. If he got restless with people approaching, we only needed to say a few reassuring words to him and he'd nod off to sleep again - he was just so exhausted the poor little thing. Initially, one of the Fisheries guys said it was best to leave him to regain strength as his mum was probably waiting off shore for him to recover. But once we pointed out his bad eye and explained how deep the cut was on his flipper (which he'd tucked under himself), they decided he should be seen by the vet at the sanctuary before returning him to the seal colony in Port Phillip Bay. By that stage, he was so at ease with us, that he even let John gently pat him before we put him into a nice warm sleeping bag for his trip to Barwon Heads. We decided to go over to Jirrahlinga the next day to see how Jack was getting on - we sort of felt responsible for his welfare! He'd regained some of his strength after more than four hours resting in the sun and the Fisheries guys were sure he'd make a complete recovery. It was after one o'clock before we got home and it was more than an hour later before we realised that we hadn't said a word to each other - we were both cherishing our memories of Jack and a very special day we'll never forget - and words couldn't express the way we were feeling. That night we said maybe one of us should have come home to grab the camera or something, but neither of us wanted to leave him until we knew he was in safe hands and out of harms way. Maybe we'd be able to take his picture the next day when we went to visit Jack at Jirrahlinga. It didn't matter really, our thoughts and feelings for Jack were as real as a photo and we knew they would be with us forever - he was just beautiful. On Monday (12th August) we went to the Jirrahlinga Wildlife Sanctuary across the river at Barwon Heads - and were we in for a surprise! We found out that we had been confusing our baby seal by calling "him" Jack - she was a she, so her name is now Jacqueline! Jacqueline had spent the night in the company of some baby wombats - the head keeper said that a baby seal can be really stressed being separated from Mum and so she enjoyed the company of the wombats! She had a raging temperature when she got to the sanctuary the day before, but it was almost back to normal on the Monday. Her eye had really cleared up and she had two beautiful big eyes. 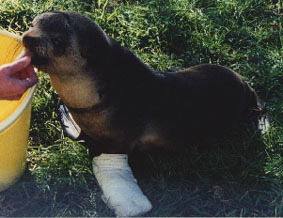 She was scheduled to have surgery on her flipper that afternoon, but the prognosis was for a complete recovery. 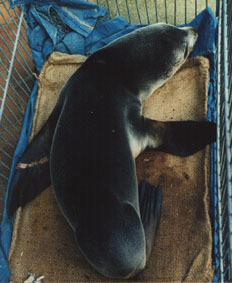 The vet would decide the following day whether she would stay at Jirrahlinga for a while or be sent to Melbourne Zoo for more expert seal care as the local seal expert was about to leave for a couple of weeks holiday. They were terrific at the sanctuary and brought Jacqueline out of the nursery so her "adopted" mum could take some photos. She seemed pretty contented which was lovely to see. Boy we were glad that we went over to visit her - it was nice to know that all those hours babysitting were worthwhile. On Wednesday morning (14th August) there was another seal on Ocean Grove beach! It was a little further west than where we had found Jacqueline. This one was a large Leopard Seal from the Antarctic - predominantly white with grey spots mainly on its belly. The Fisheries department had been keeping an eye on it because it's quite rare and did not seem to be very well at all. It certainly didn't need babysitting as dogs, kids and adults were all intimidated by its size. It's still very beautiful, but not nearly as cute and cuddly as little Jacqueline (who was doing very well at the Sanctuary). Initially when we realised that there was another seal on the beach, we thought it could be Jacqueline's mum, but little Jacqueline is a fur seal and not related to the leopard seal. It's been a busy week at the beach! After seeing the leopard seal, I kept thinking about Jacqueline so I hopped in the car and went over to Jirrahlinga. The decision had been made to send her up to Melbourne and she headed off to her new abode that Wednesday morning. On Wednesday 21st August, I spoke with Kim Beasely, Head Keeper of Marine Mammals at Melbourne Zoo - she was keen to get some more information on where we found Jacqueline and her condition on the first day. Well, the big news from Kim was that Jacqueline was no longer her name! Not because she wasn't a girl but because of where they believe she came from. I'd been saying that she was the cutest looking seal I'd ever seen, and it turned out that she wasn't a common fur seal. She was actually a Subantarctic Fur Seal which probably explained the amount of silver and white on her. Apparently it's quite rare to find one so far north. She'd been renamed Mac because the nearest colony of Subantarctic Fur Seals is on Macquarie Island down towards that big block of ice in the south (Antarctica). She'd been dining on a mixture of fish - Tommy Ruffs, Red Mullet etc. She wasn't too keen on the squid though. She was having three meals a day consuming about 600 grams at each sitting. It appears that part of the injury to her flipper was a lot deeper than first thought and had damaged and infected the bone. Consequently she was being kept out of water for about two weeks while she had a plaster cast on her injured flipper - she was in the hospital / quarantine area apart from all the other seals. When we found her we noticed an injury around her neck and it appears that she may have been caught up in fishing line or a net with the injuries to her flipper as well as her neck. She may also have received more injuries on the beach as she was under the fence wire between the beach and the sandhills when we first spotted her. Anyway, she was coming along fine and charming all her keepers at the zoo. John and I had "visiting rights" and hoped to get up to Melbourne the following week to visit her. Once she was out of plaster, the zoo planned for her to spend a couple of weeks with water in her pool and being reminded that she was a seal who was supposed to swim and catch her food. They then hoped to release her back into the ocean. A special visit to see "Mac"
Friday 30th August - a most unforgettable day - we went to visit Mac. We arranged to meet Mac's keepers at 3.00 pm, and collected John's daughter on the way for this special visit. We spent a wonderful hour and a half talking to Mac's carers and visiting Mac while she was being fed. And did she look motherable!?!? Mac was 10 kg when she first got to the zoo just over 2 weeks ago - she was now 13.6 kg. 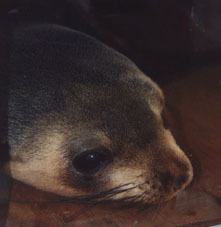 Adult female Subantarctic Fur Seals grow to about 40-50 kg, so Mac is about one third adult size. From close inspection of her canine teeth, it had been determined that she was about 18 months old. She was no longer a bluey/silver colour - she was now a lovely shade of brown. I forgot to ask why she had changed colour so much, but I guessed it was because she hadn't been in the water for nearly 3 weeks. We went well armed with the camera as well as the video camera and they were put to plenty of use! We were taken to visit her in the quarantine / hospital area and sat through her regular feeding session - it was absolutely wonderful. She looked amazing with her left flipper done up in plaster, but it certainly hadn't slowed her down - she was so lively and quite pathetic the way she "sooked up" to her keeper for more fish!! Once her plaster cast came off, she'd be playing in her own private pool and the zoo hoped to release her out into Bass Strait about the end of September. In the meantime she would be kept isolated, and human contact and feeding would be kept to a minimum. She would be taken by boat, probably from Queenscliff, and we had our fingers crossed that we could be present at the farewell. Mac would be tagged so there'd be a chance of learning about her progress in the future. The zoo had hoped to have a satellite sensor implanted, however it was decided that Mac was too small a candidate. It was the most wonderful visit - Kim and Karen spent so much time telling us about Mac and her relatives, and we got some wonderful footage on video that we will treasure for ever. It was just so great to see Mac looking so well and lively - she's a real little treasure with personality plus. Gosh it felt good to see her! Over the next few weeks, we continued to get progress reports on Mac from the zoo. Friends who went to the zoo weren't able to visit her, but they always checked on her progress and reported back to us. We knew she was out of plaster, and wondered how long before she would be well enough to return to the wild. Wednesday 2nd October the phone rang - Mac was to be released back into the ocean tomorrow - could we be there to farewell her? Wild horses couldn't keep me away! We met at the Ocean Grove boat ramp on the Barwon River - Mac in her transport box with her keeper and vet from the Melbourne Zoo, three guys from the Fisheries and Wildlife department with a half-cabin cruiser and an aluminium hulled rubber duckie, and a family with young kids who had joined us on the beach on that first memorable day in early August. Mac was a little unsettled after her long trip in the van from Melbourne, but once she was moved onto the boat she seemed to sense that she was heading home - perhaps it was the smell of the sea or the gentle rocking of the boat. Mac's flipper had healed terrifically and she had put on plenty condition - she was now a healthy 16.5 kg and ready for her big journey. I had to chuckle - she had tags on each of her front flippers - Z24 and Z25 - I've secretly pretended that the "Z" stands for Zada (my surname)!! Shhh! 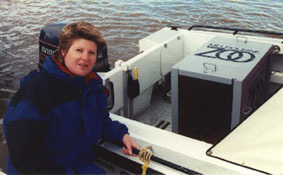 Once Mac was loaded at the boat ramp, the boats then went down river to the Barwon Heads jetty just inside the river mouth. There she was greeted by a press contingent from Melbourne and local television stations and newspapers, along with a crowd of locals who came to see what all the fuss was about. I had said my private farewells back at the boat ramp, but I watched the contingent bounce through the waves and swell at the river mouth and head south into Bass Strait - I couldn't wait to hear how she went. She hadn't been fed since yesterday as they hoped she would be so hungry she'd concentrate on finding food and not be distressed. As soon as the boats returned, Mac's keeper told me that everything was fine - and watching the Channel 7 news that evening it was obviously true. Mac slid out of her box and frolicked in the water - extremely contented. Mac looked healthy and happy - that's the most important thing - even though I'm already thinking silly things like "she's all alone out there in the cold water" - but then again, it can't be nearly as cold as her home down at Macquarie Island! We'll never forget little Mac and our incredible good fortune to be a small part of her life.